Today was another great day to be at Camp Timberlake. The sun came up early and there was a blue sky all day long. The boys enjoyed some tasty pancakes on their first day of camp. Following breakfast the boys ventured out of the tucker inn and headed to the back green for the morning yell. The morning yell today was led by Charlie R. The morning yell consists of the boys yelling to another great day and adventure at Camp Timberlake. Before the yell Charlie R will inspire the kids by a strong motivating speech. After the yell Ben A, Tim M and Tom B went to Lake James to go Mountain Biking. On the trail Tim learned how to corner turns, which promoted a lot of improvement in his biking. Tom Bryan continued to improve in his down hill technique and pumping through flowing parts of the trail. After mountain biking eleven miles the boys loaded up their bikes and drove over to the beach and ate and swim during lunch. Another trip that had a good day was Kayaking. The boys raced up to the chapel after the yell to ring the bell and then start chapel. Chapel consists of three worship songs and a short message by one of the councilors or program staff. After the locations of Team Sports and Climbing are told the boys headed up to the cabins to clean their respective cabins. At 9:30 the boys headed to their first and second period. Day one always starts with safety talks, but this did not prevent the boys from having a blast in their classes. In swimming today the boys learned free syle and did some relay races. The relay race today came down to the wire but thanks to Alex A his team clenched a win. In kayaking today the boys demonstrated some awesome wet exits. Because of this the boys will have a good foundation to build on. At 11:30 the boys were released from their activities and had 15 minutes until lunch. Making there way to the Tucker Inn, everyone dined on grilled ham n’ cheese sandwiches, which paired with tomato soup, made for a yummy meal! After lunch the boys headed up to rest time then free time at 1:00. 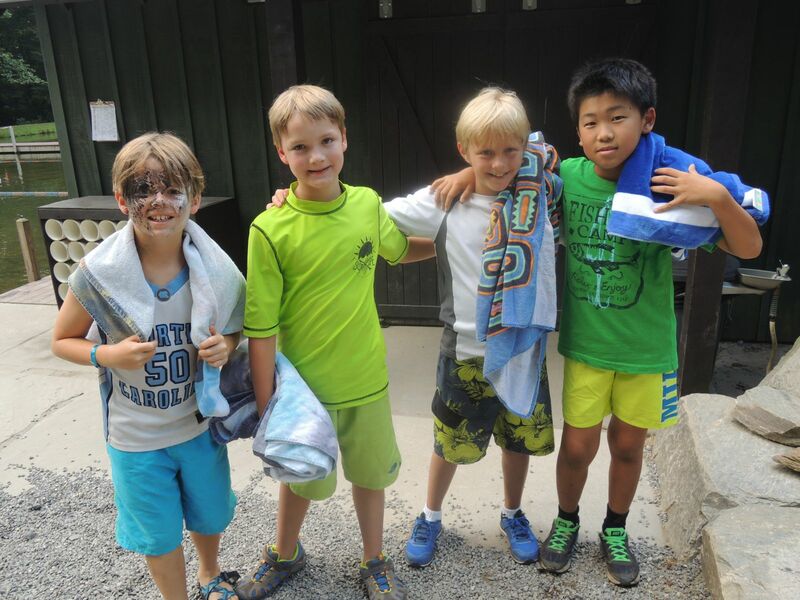 During this time the boys were able to get their favorite drink and candy and then play tetherball (a camp favorite), free swim or work on bars in their respective activities. At 2:30 the boys went to third and fourth activities where pottery learned how to make pinch pots. Also Chase and Cole R and Joe B shot well in Archery. In Mountain Biking the boys learned how to change a flat and identify parts of a bike, next class they will learn how to do basic skills on the grass and see camps new berm and pump track. At 5 p.m. the boys had the famous Sunday dinner, fried chicken and mashed potatoes and then elected tribal positions Iroquois elected Hank B as MedMan, to run things alongside the already established Chief Seth H. The Seminoles granted the Chief position to Grant H and Charlie D as his MedMan. After elections the boys played inferno and participated in post evening activities with their cabins.